Ambler’s Texaco Gas Station, also known as Vernon’s Texaco Station and Becker’s Marathon Gas Station, is located along historic Route 66 in the Village of Dwight. The station gets its name from longtime manager Basil “Tubby” Ambler, who operated the station from 1938 to 1966. The original 1933 building Jack Shore built consisted of an office with wood clapboard siding, an arched roof with asphalt shingles, and residential windows adorned with shutters and flower boxes. Extending out from the office over three Texaco gas pumps was a sheltering canopy supported by two tapered columns. Mr. Shore also constructed an ice house located on the property. The station’s design, with its cottage look, may strike the contemporary traveler as quaint--or perhaps even odd. Why, after all, shouldn’t a gas station look like a gas station? But this domestic style, common along Route 66, had a distinct purpose and stems from a time in the early 20th century when gas stations were just beginning to seriously intrude upon the suburban landscape of America. The oil companies wisely opted to tread lightly on this new, non-commercial territory. Gas stations were consciously styled to be homey and inviting to customers, as well as inconspicuous in their new residential, suburban surroundings. In the early 1940s, following a national trend that saw gas stations evolve to full service garages, Mr. Ambler added a service bay of simple concrete block to the north side of the original building. Although he left the station in 1966, the station continued servicing motorists until nearly the turn of the 21st century, making it one of the oldest continually operated service stations along the Mother Road. Over the years, the station naturally underwent a number of changes. Windows were removed and added, fresh paint applied, and new roofing laid down. The tall, elegant red pumps of the 1930s gave way to the squat dispensers of the 1960s; and Marathon Oil eventually superseded the Texaco Fire Chief brand. 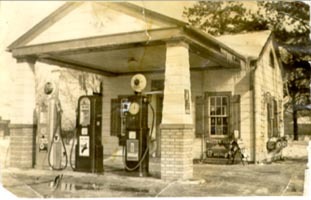 The station operated as a gas station for 66 years until 1999 and was an auto repair shop until 2002, when the owner Phillip Becker generously donated the station to the Village of Dwight. With the help of a $10,400 matching grant from the National Park Service’s Route 66 Corridor Preservation Program, the Village of Dwight painstakingly restored the station to its former glory, taking the main office and canopy area back to the 1930s and the service bay area back to its 1940s appearance. Today, the station serves as a visitor’s center for the Village of Dwight. It was listed in the National Register of Historic Places in 2001 and received a Cost-Share Grant from the National Park Service Route 66 Corridor Preservation Program in 2002. 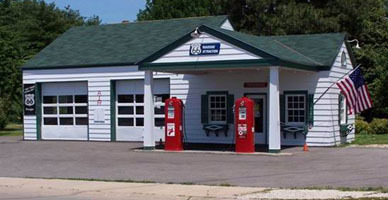 Ambler's Texaco Gas Station, now the Village of Dwight's visitors center, is located at the northeast corner of Old Route 66 and Illinois Route 17 in Dwight, IL, and is open to visitors traveling historic Illinois Route 66. For more information, call 815-584-3077.